Diabetic Foot Ulcer (DFU) is one of common complication of Diabetes Mellitus (DM) patient that can disrupt the quality of life. Some study tells that exercise, specifically foot exercise can help to reduce the ulcer and promote the wound healing in DFU. This report was made to know about the effectiveness of foot exercise on diabetic patient with foot ulcer. Using several database related keywords in PubMed, EbscoHost, and ProQuest, using inclusion and exclusion criteria. As the result from data extraction process, only one article was found to satisfy the inclusion criteria. Eraydin et al., found that in 12th week the mean of DFU size in control group decreased 25%, while in intervention group decreased 75% compared to baseline. Significant differences (p=0.000) were found in mean ulcer size in both control and intervention groups between baseline mean ulcer size and 12th weeks mean ulcer size. It showed significant benefits of foot exercise despite the short duration of exercise being used as intervention to reduce diabetic foot ulcer area. Diabetes is one of non-communicable disease. According to Riset Kesehatan Dasar Nasional (RISKESDAS), a basic health research from ministry health of Indonesian republic in 2013, type 2 diabetes is ranked the top 4thposition in non-communicable disease. Diabetes is a metabolic disease that arise in a person because of an increase blood glucose levels, which can be caused by insulin disorder . The most complications that experienced by patient with diabetes is Diabetic Foot Ulcer (DFU), because this region is especially more prone to this phenomenon. If left untreated, the risk of diabetic ulcer can increase , which can disturb them physically and psychologically. The risk of wound caused by DFU may lead to amputation. Epidemiologically, amputations in patient with DFU can increase 2-4 times as much with age and duration of diabetes regardless of the type of diabetes experienced . According to Indonesian Endocrinologist Association (PERKENI), the principal management of diabetic is to improve the quality of life of the patient by controlling the blood glucose, blood pressure, body weight, and lipid profiles through a comprehensive patient management . In diabetic patients, regular exercise can help to reduce body weight, control blood glucose and increase insulin sensitivity, which can reduce the incidence of neuropathy that is a major factor of DFU. A male, 46 years old came to clinic with the chief complaint of wound on his right plantar region for 1 week. Patient has been diagnosed has type 2 diabetes and regularly consumed metformin in the last 2 years but the blood glucose level still uncontrolled. After physical examination, the wound classified as grade 1 ulcer of Wagner classification. Using a database such as PubMed, EbscoHost, and ProQuest on May 10, 2018, using the keyword diabetes mellitus OR diabetes mellitus type 2 OR T2DM OR NIDDM AND exercise OR foot exercise AND foot ulcer. With inclusion criteria; last 10 years, full text, English language, and relevant to clinical questions (Figure 1). After getting 1 article related to clinical questions, it was appraisedaccording to the criteria of center of evidence based medicine, university of oxford and considered to match criteria of good validity and relevance according to centre of evidence medicine university of oxford (Table 1). The journal was considered to have a good level of evidence based on center of evidence Medicine University of oxford based on the validity appraisal. The journal clearly states its study design and number of participants. The study has clear explanation of randomization, also the treatment was comparable and there was clear measurement of outcome. Similar population of those with type 2 diabetes was used as study population and the intervention applicable to be implemented. The benefit of the study is greater than of harm and cost. However, there have been no studies yet about how is the patient preference in Indonesia. Based on the journal, all of the patients in intervention group were taught the diabetic foot exercise by researcher and they were asked to exercise twice daily for 12 weeks. The control group and intervention group received standard wound care. The baseline DFU area of intervention group was 12.63 (14.43) cm2 while the control group was 24.67 (20.70) cm2. In first 4 weeks there’s no change in control group in terms of mean size of DFU, 24.75 (20.84) cm2, but there’s 50% reduction in the intervention group, 6.91 (5.44) cm2. In 8th week the mean of DFU in control group was 20.339 (20.79) cm2, decreased 17.5%. Meanwhile in intervention group was 4.30 (3.70) cm2, 66% reduction compare to baseline. In 12th week the mean of DFU size in control group was 18.52 (21.49) cm2, decreased 25%, while in intervention group was 3.29 (3.80) cm2, decreased 75% compared to baseline. Significant differences (p=0.000) were found in mean ulcer size in both groups between baseline mean ulcer size and 12th weeks mean ulcer size. A study by Eraydin et al., involved 65 patients with type 2 DM and classified as Wagner grade 1 or 2 Diabetic Foot Ulcer (DFU) and randomized to control group and intervention group. Additional inclusion criteria were age between 20 and 80 years; not having dementia and mental problems; no systemic diseases that can hinder ability to exercise; standard wound care protocol; no other treatments that could affect wound healing. 60 patients completed all time points of study, each group consist of 30 patients at the end of the study. In this study, they also examined debridement as another factor related to the depth of the wound. Debridement is often necessary in chronic wounds for both diagnosis and treatment. Patients got standard wound care protocol (cleaning the wound with saline, covering it with gauze dressing) and didn’t get another therapy that could affect wound healing such as negative-pressure wound treatment, hyperbaric oxygen treatment, a special wound care product, special wound dressing, or growth factor. The foot exercise includes range of motion movements of plantar flexion, dorsiflexion, inversion, eversion and circumduction of toes (Figure 2). The exercise, take place after taking insulin, should include 5 to 10 exercise with 10 to repeats. If the blood glucose level >300 mg/dL and blood pressure >180 mmHg, the patient is not allowed to do the exercise. Patients must stop exercise if they feel nausea, dizziness, or drowsiness. The specific instruction for patient is avoiding weight bearing exercise and complete the foot exercise program in sitting position and in standing position after the wound heals. In this study, an important finding was that study intervention group patients, who performed exercises for a longer time, experience more of a decrease in the size of the ulcers, compared to those who performed exercises for a shorter time. The control group began to experience a change in the wound size after the 8th week, while the study intervention group began to experience improvement after the 4thweek. At the end of the study, 12th week, the mean of DFU size in control group decreased 25% compared to the baseline while the mean of DFU size decreased 75% in intervention group. The gold standard for diabetic foot ulcer treatment includes debridement of the wound, management of any infection, revascularization, and off-loading of the ulcer . Exercise also helps improving of wound healing because oxygen can ensures energy production from ATP and stimulates cellular metabolism and angiogenesis, after that oxygen can increase fibroblast proliferation, collagen synthesis, and epithelization, so could make the wounds shrink in size and wound infection is prevented. This was related to changes occurring as the result of exercise (muscle activity, increase in blood flow to the wound area, and decrease in hypoxia) . There is an increasing amount of evidencedemonstrating that regular physical activity and/or exercise may decrease levels of inflammatory markers in the blood. Also strong evidence to suggest thatexercise can increase antioxidant enzyme activities which canprevent damage caused by free radicals . Exercise positively influences other pathological factors associated with Diabetic Peripheral Neuropathy (DPN), by promoting microvascular function and fat oxidation, by reducing oxidative stress and increasing neurotrophic factors . Flahr et al. 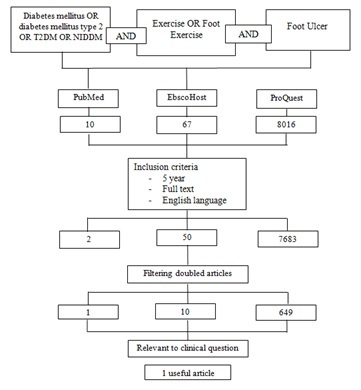 , studied the effect of 12 weeks non-weight bearing exercise (intervention group) on diabetic foot ulcer healing compared to usual care regimen (control group). In the intervention group, 90% of the wounds progressed toward healing or healed, compared to 62.5% in the control group. The ulcer related features (ulcer classification, ulcer localization, necrosis and infection) measures were found insignificant, but there is marked improvement observed. This may happen due to small sample that involved and short duration of intervention. Unexpected variation between the two groups with respect to age, gender distribution, comorbidities, and wound culture results may have affected the overall study outcome. In this patient, foot exercise can be used as intervention to reduce diabetic foot ulcer area and get improvement of wound healing. This kind of exercise can be applied to general population because it is easy and cost effective. However, further studies with longer duration and bigger sample size are needed to confirm the finding. Badan Penelitian dan Pengembangan Kesehatan (2013) [Riset Kesehatan Dasar (RISKESDAS) 2013]. Riskesdas 1-306. Mirtha LT, Permatahati V (2018) The effectiveness of aerobic exercise in improving peripheral nerve functions in type 2 diabetes mellitus: An evidence-based case report. Acta Med Indones 50: 82-87. Perkeni PB (2015) [Konsensus Pengendalian dan pencegahan diabetes melitus tipe 2 di Indonesia.] Perkeni, Pg no: 1-93. Alexiadou K, Doupis J (2012) Management of diabetic foot ulcers. Diabetes Ther 3: 1-15. Eraydin Ş, Avşar G (2017) The effect of foot exercises on wound healing in type 2 diabetic patients with a foot ulcer. J Wound Ostomy Cont Nurs. Keylock KT, Young H (2010) Delayed Wound Healing: Can Exercise Accelerate it ? Int J Exerc Sci 3: 70-78. 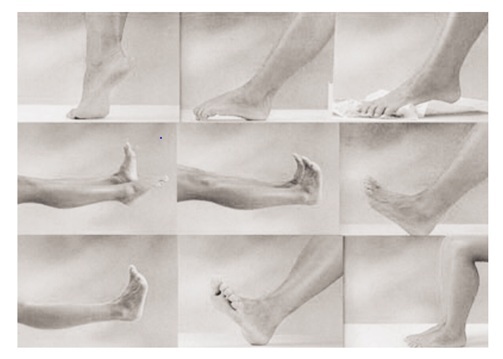 Francia P, Gulisano M, Anichini R, Seghieri G (2014) Diabetic foot and exercise therapy: Step by step the role of rigid posture and biomechanics treatment. Curr Diabetes Rev 10: 86-99. Flahr D (2010) The effect of nonweight-bearing exercise and protocol adherence on diabetic foot ulcer healing: A pilot study. Ostomy Wound Manage 56: 40-50. Figure 1: Search strategy flow chart. Figure 2: The foot exercises. Was the assignment of patient to treat randomized? Were the group similar at the start of the trial? Aside from the allocated treatment, were groups treated equally? Were all patient who entered the trial accounted for?-and were they analyzed in the groups to which they were randomized? Were measures objective or were the patients and clinicians kept “blind” to which treatment was being received? Will this result help me in caring for my patient? Is my patient so different to those in the study that the result cannot result apply? Will the potential benefits of treatment outweigh the potential harms of treatment for my patient? Table 1: The critical appraisal (validity, importance, and applicability) of this study. Citation: Mirtha LT, Ariono M, Putra SM (2018) The Effect of Foot Exercise on Diabetic Patients with Foot Ulcer: An Evidence-Based Case Report. J Diabetes Metab Disord 5: 26. Copyright:© 2018 Mirtha LT, et al. This is an open-access article distributed under the terms of the Creative Commons Attribution License, which permits unrestricted use, distribution, and reproduction in any medium, provided the original author and source are credited.